Buying for Canning/Freezing - Come for the Freshness! Stay for the Fun! enjoy local produce all year long! when the farmers have surplus produce and preserving it for later. Check with any of the market farmers about bulk purchases. 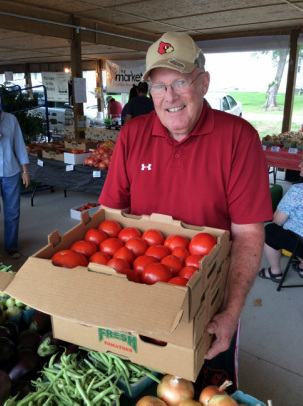 These farmers often have boxes of canning tomatoes available during the height of the season. other veggies, just visit with the market farmers. we usually have just as much produce, just fewer customers. We've wrapped up our drawings for the Ball Jar table this season - over 50 winners! - but we still have recipes, canning booklets and discount coupons for canning supplies and Food Savers. Stop by. For recipe ideas, go to the Ball Jar website.